I'm putting together a set of paper dice to use as an RPG aid. These are six-siders that have words instead of numbers on their faces. I'm trying to pack as many kinds of these dice into one product, and I'm hoping to get some ideas for dice that might be useful. Weather: There are 3 dice for weather, so you can roll for random weather conditions in warm, temperate or cool climates. For example, the die for warm weather has these possible results: sunny, blazing, hot, warm, windy, hazy. Hit location: There are 5 dice for this. First, there's a general location die with the results: head, body, left arm, right arm, left leg, right leg. For each body part, there's a more specific hit location die. The "arm" hit location has these results: hand, wrist, finger/thumb, elbow, forearm, shoulder. Events: This is a general-purpose die that can be used for just about any skill check, action or attack. This die can help explain the reasons for the success or failure of a particular action. The results are things like sense (what you were able to see, or what your opponent was able to see, affected the outcome), time (haste or delay affected the result), space (the distance to your target, the available room, or some aspect of the environment was largely responsible for the outcome), etc. Travel: A die that indicates if the path is clear, if it's blocked, if there's an ambush, if you meet another traveler, etc. Treasure: The relative value of loot from that rust monster you slew. Can you think of any other dice types that might be useful? You might be going in this direction already, but maybe something to help with solo playing a skirmish game. A way to model the "enemy's" actions. You may have to customize these a bit to a specific game system. Something compatible with Infinity or Warmachine without using any terms that are intellectual property. At least do separate ones for modern and fantasy based generic skirmish games. I wounder if you could couple the dice to a branching decision making tree? I don't play any skirmish or wargames, so I really wouldn't know where to start with those. (Ironic, I know.) These dice are designed as a roleplaying aid, which is something I'm much more familiar with. I like the idea of branching decision trees, but that could be its own product. I'm not sure how those could be made universal enough to apply to lots of different RPGs, but I'll let that idea roam around and see what happens. I think a "tide of battle" die might be useful for mass combat in RPGs. PCs will be focused on their detailed zoomed-in part in the fight, while the GM can use this one die to decide how the overall battle is going. I've added some random terrain generators. Like the weather dice, these are set up for cold, temperate and warm regions. I should add dice for maritime terrain and weather, too. This first set will be geared toward medieval/fantasy settings, and the dice will have a rustic look to them. Later on, I might create other sets for horror, space and post-apoc. I'm planning to include a full set of blank PNGs so you can add whatever you want to the dice. Added terrain and weather dice for mountainous, river and maritime journeys. I'll do one for NPC dispositions, and one for travel encounters. That should cover just about everything I'd want as a GM. Just had a random idea. Dice for zombie based games. You can determine what kind of zombies (Fast or slow moving), how many and how they behave. Even a random movement generator with arrows on it. Stagger, Stumble, Moan, Crawl, Rraagh! (charge), Blink? How about Critical Hit and Critical Miss outcome dice? Maybe those are too wordy? You get the idea. What about booby trap dice for locked treasure chests, doors, or corridors? Maybe: Spikes, Poison, Acid, Explosion, Boulder, and Guillotine? All good ideas! I've just released the first set of Story Dice, so these new ideas will probably find homes in other dice sets. The zombie stuff could go into a horror/gothic dice set -- or a dedicated zombies set. I think SGJ just released a game called "Zombie Dice" so the obvious product name has been snagged. I like the idea of criticals. This could be developed into a pretty large number of dice, since each sort of activity demands its own sort of critical success or failure. A trap die is too good to pass up. 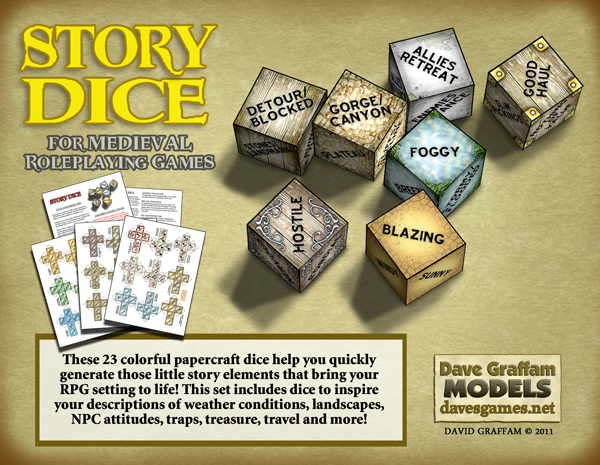 Since no one has picked up this story dice set yet, I'm going to take it offline for a bit and add a trap die. I actually have space for just 1 more die on the last page of the PDF, so that's perfect. Thanks, gang! Keep the ideas (uh) rolling in! I added the Traps Die, and this set's back on sale again.